Nov 16 (Reuters) – From India’s plan to plumb in over 100 million toilets in six years to China’s ambitious new Silk Road network and the continued movement of millions of people into cities across Asia, plastic makers face years of strong demand. And, because they are closer to end-users and manufacturing hubs, Asian petrochemical makers are best placed to ride the boom. Their profits and share prices are rising and they’re investing in new projects to expand their business. Petrochemicals, seen as a niche business in the oil industry, are used in 70 percent of manufactured goods – from mobile phones and yoga pants to cars and food packaging – and bring in valuable revenue for a sector otherwise battling over-supply.Chinese futures prices for PVC (polyvinyl chloride) , used in products from pipes to bank cards, have risen more than 80 percent this year. Annual demand for ethylene, the most-used compound among many petrochemical products, is expected to grow at over 10 percent in the coming decade, analysts say. In just one illustration of how demand is set to grow, the “Clean India” programme, seeking to end open defecation by 2022, has been welcomed by the Indian Petrochemical Industry group as a “boon for the plastics industry” – requiring building hundreds of millions of toilets, waste pipes and water supply systems to bring clean sanitation to more than 700 million people. “There is tremendous potential for petrochemical demand to go up because per capita consumption is so low. There is a plastic usage in every utility,” said B. Ashok, chairman of Indian Oil Corp, which has a petrochemical plant at its refinery in Panipat, to the north of Delhi. “Demand is strong not only for toilets. India is short of domestic PVC supplies and has been sourcing from countries including South Korea, so Korean export volumes are growing,” said Hwang Kyu-won, analyst at Yuanta Securities in Seoul. 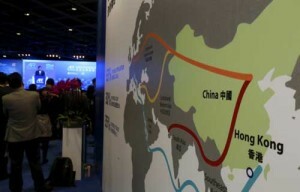 China’s “One Belt, One Road” project – to build a vast rail, road, shipping and factory network between China, central Asia, Africa and Europe – will also require millions of tonnes of plastic materials, noted Luna Kim, principal consultant at Chemical Market Research Inc. This, together with the urbanisation of tens of millions of people across Asia each year, means the region will have as many as 650 million new petrochemical customers within two decades, predicts research firm IHS Markit. Mark Eramo, vice president for global chemical business development at IHS Markit, said the Asia Pacific region will “have the lion’s share of the total investments” in petrochemicals until 2025, adding another 100 million tonnes of basic chemical production, including ethylene. “Ethylene and its related product supply will remain tight over the next 12 months,” Japanese bank Nomura said in an investor note. The demand boom is showing across markets, with IHS Markit expecting overall 2016 Asian ethylene margins of $600 per tonne, up from below $400 last year. In Thailand, PTT, Thai Oil and Siam Cement all reported strong profits in the last month, citing the performance of their petrochemical divisions. To be sure, plastic makers from the United States, Europe and the Middle East, such as BASF, Exxon Mobil , Total and Dow Chemical, also hope to profit from Asia’s soaring demand, but those closer to that demand should benefit most from lower transit costs and cheaper feedstock prices. “Asian petrochemical makers can be winners over U.S. petrochemical makers,” said Jae-sung Yoon, analyst at Hana Financial Investment in South Korea. Asia’s leading refiner Sinopec Corp has announced a joint venture with Taiwan’s Dynamic Ever Investments to build a petrochemical complex in China’s southeastern Fujian province, while Korea Petrochemical Industry Corp and Malaysia-based Lotte Chemical Titan plan to expand next year. In the Philippines, JG Summit has also said it plans to expand. Malaysia’s state-owned energy firm Petronas has a $27 billion refining and petrochemical complex due to come on stream in 2019. Asian petrochemical makers are also at an advantage in that they largely use the fossil fuel naphtha as a feedstock, while the main feedstock in the United States is natural gas. “By using natural gas as a feedstock, U.S. ethane crackers can only obtain ethylene. However, Asian naphtha crackers can also produce other byproducts like butadiene and propylene,” said Yoon at Hana Financial. This feedstock flexibility has helped Lotte Chemical, Formosa Petrochemical and India’s Finolex Industries outperform share price gains at manufacturers based in other regions.